Is your IT services provider in Los Angeles giving you offsite storage to help with disaster recovery efforts should your system experience a cyber incident? If not, your company could be in for a multitude of unnecessary and expensive headaches should a breach or other attack occur. Many business owners make the mistake of thinking that new technology, including the use of smart devices and outsourcing to managed IT companies, makes the necessity of off-site storage a thing of the past. This is a dangerous assumption to make, though, and one that could easily cost their business in the long run. If you have all your data stored on in-house servers or devices, a natural disaster such as a flood, earthquake, or even a massive storm could take out all your data in as little as a minute. This holds true if you’re working with a managed IT company that stores everything in-house as well. When you have an off-site or cloud storage system in place, your data will be safe no matter what happens to your physical office. Though it won’t eliminate all your losses in the event of a disaster, it will at least allow you to get back up and running in less time. Maybe an earthquake or flood isn’t in your future, but that doesn’t mean you’re safe. Your employees can create disasters of their own, either on purpose due to being fired or mistreated, or by accident. A weak password, downloads of an infected file, or simply connecting to an unsecured network can be enough to shut down your entire operation and result in the loss of all your important data. You can never fully account for the ‘human factor’ in your business, so it’s always a good idea to have a back-up system that employees don’t have access to. Do you think off-site storage is hugely expensive? Think again. With new technology, a cloud-based system can be set up that is highly affordable as well as easy to access. In fact, it’s so easy to access that it can be indistinguishable from your in-house data storage. With the benefit of being inexpensive as well as secure, there’s no reason for business owners to avoid this important step. No matter how much you or your IT service provider have in the way of onsite backups, they simply will not withstand an event that strikes at the physical location of the office. When you store information on the cloud, the data is independent of any location and cannot be compromised by a physical threat. 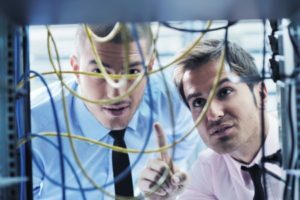 If your IT services provider in Los Angeles isn’t giving you options that include an offsite disaster recovery plan, you should consider working with a different company. Affordable and critical in the case of an on-site disaster or breach, an offsite backup plan can be your IT department’s best friend. Here at Intelecis, Inc., we can secure your business with a solid backup and disaster recovery plan that works. If you have any technology-related questions or would like to know more about our company, don’t hesitate to contact us.